This full day Wood for Good seminar and workshop will discuss solid timber panel systems for construction that utilize no glue or adhesives. Researchers at Edinburgh Napier University, Centre for Offsite Construction & Innovative Structures (COCIS) and ERDF funded Wood Products Innovation Gateway (WPIG) in partnership with industry architects, engineers and builders will present their design and engineering work on homegrown UK sourced stacked plank & dowelled (brettstapel) and interlocking solid timber. This CPD event will focus on glue-less and non-adhesive solutions for solid timber as an alternative to cross-laminated timber construction. NO-GLUE solid timber has the potential for early market entry, reducing the need for considerable manufacturing investment that accompanies traditional CLT. 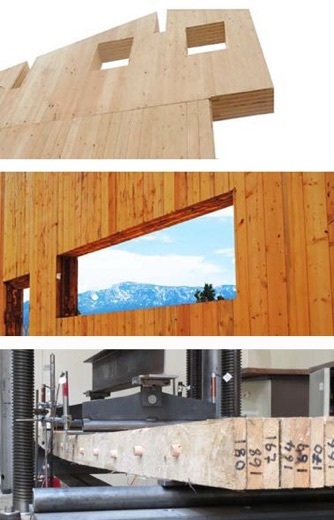 In partnership with David Blaikie Architect, Neil Sutherland Architects, MAKAR, and Euclid Timber in the USA, researchers at Edinburgh Napier University and University of Utah, ITAC have tested and developed alternative systems to cross-laminated timber. This workshop welcomes companies and professionals from across the timber supply chain and construction sectors to learn about natural construction from home-grown resource. Researchers from Edinburgh Napier will present in tandem with industry partners to demonstrate research to commercialization and live project applications. In addition to demonstrating the current work of the Centre for Offsite Construction and Innovative Structures (COCIS) and ERDF funded Wood Products Innovation Gateway (WPIG), this seminar will conduct roundtable discussions among researchers and industry with the purpose of fostering new partnerships in commercialization of wood products innovation, creating value for companies and the timber construction industry. For the full event schedule CLICK HERE (PDF).